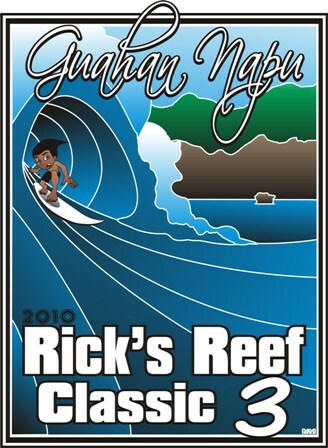 BARRIGADA, Guam, Feb. 20, 2010 –– Guahan Napu Inc., the local non-profit association of surfers and body-boarders, and organizer of the third annual Rick’s Reef Classic surfing competition, announced the postponement of the event from Feb. 27 to March 13, 2010. Willi Byerly, president of Guahan Napu Inc., said the association had to comply with filing a 30-day notice with the Guam Police Department Marine Safety division about the marine event and obtain the necessary permit to proceed with the contest. Pre-registration for the contest will now be re-scheduled to Friday, March 12 from 5 p.m.~7:30p.m. at the “Surfers’ Point” poolside bar of the Sheraton Laguna Guam Resort. Sign-ups will not be accepted on contest day. GNI will also hold a judging clinic for volunteer judges on March 9, four days prior to the event. Individuals interested to volunteer as judges should contact Ken Concepcion, vice president of Guahan Napu Inc. and the event’s head judge, at 689-2673.